At Blue Jays WinterFest, I had the opportunity to talk to Blue Jays pitcher Joe Biagini. Biagini has developed a reputation as a good interview in his time with the Blue Jays, something that shone through during his media availability at WinterFest. He chatted with us about his entrance music (Tears of a Clown), his love of Seinfeld and his dabbling with Curb Your Enthusiasm, while finding opportunities to make a joke in response to just about every question he was asked. As Hayden Godfrey elaborated on, in his own post on our chat with Joe, there is nothing but authenticity in Joe Biagini. He cherishes the fact that people even want to interview him and that a simple encounter with a fan might stay with them forever. In this regard (and others), Biagini is a great role model for professional athletes everywhere. My primary area of interest with Biagini was his evolving role with the Blue Jays since he arrived in 2016. In his rookie season, Biagini was a phenomenal reliever, probably a lot more effective than even most Jays fans remember. He ranked among the league leaders in terms of fWAR (1.2, 34th among all MLB relievers) and FIP (2.95, 30th-best among qualified MLB relievers and tops in the Blue Jays bullpen). These results weren’t smoke and mirrors, with his strong xwOBA (.282) highlighting his genuine ability to generate weak contact. He also stood out among first-year players, ranking eighth among rookie relievers and 39th among all rookies in terms of fWAR. Biagini started the 2017 season in the bullpen, making 14 appearances (18.2 IP) through May 3rd. He was even more effective during this stretch than he was in 2016, running a 2.84 FIP on the back of a better-than-average strikeout rate (23.9%), walk rate (4.2%) and home run rate (0.48 HR/9). His xwOBA was a pristine .249. At that point, injuries to multiple starters led the team to move him from the bullpen to the rotation, which began a stretch of one year (May 7th, 2017 to May 8th, 2018) in which he was used alternately as a starter and reliever. His time as a starter caught my attention in a few ways. In August 2017, I discussed the extremely bad luck he appeared to have dealt with, evidenced by a league-low strand rate and massive gaps between his 1) ERA and FIP and 2) wOBA and xwOBA. During the ensuing off-season, I dug into his performance with runners in scoring position, finding that he was very effective with the bases empty but saw much worse results with RISP. While I was optimistic that he could produce better results in the rotation in 2018, he struggled through four MLB starts in April and May (5.63 FIP, 14.4% K rate, 10% BB rate, 1.45 HR/9), after which Biagini was moved back to the bullpen, where he remained through the end of the season. Unfortunately, he even struggled as a full-time reliever, running a 5.41 FIP in the role during 2018. Over three big league seasons, Joe Biagini has made 22 starts and 132 relief appearances. While the last couple of seasons haven’t gone as planned, his body of work still looks like that of a “major league pitcher”—over the last three seasons, the average AL pitcher produced a 4.29 FIP. Biagini has a career MLB FIP of 4.26. His struggles in 2017 and 2018 shouldn’t erase the fact that he was an elite reliever in 2016 and is a top-notch, all-around human being. 2019 is a chance for the team to see who can contribute to the contending teams of the early-2020s, teams that Biagini may absolutely be a part of. 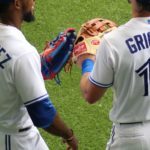 At the very least, he is under team control until 2021, his third year of arbitration eligibility and the first year the Jays will have truly high hopes for contention. However, it appears that he just barely qualified for Super Two status, thanks to his various trips to the minors over the last two seasons, and may actually be under team control until 2022 (take this with a grain of salt, as I may be misunderstanding the details of Super Two status). Either way, I look forward to Biagini getting an opportunity to focus on one role in 2019 and (hopefully) reclaiming his status as a top MLB reliever.